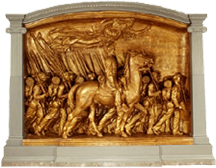 A portion of the Augustus Saint-Gaudens memorial to the Massachusetts 54th Regiment, the history of which was depicted in the 1989 film Glory . Its commander, Col. Robert Gould Shaw, received all three types of promotions during his career. Photo courtesy U.S. National Gallery of Art. Visit the memorial itself in downtown Boston, across the street from the State House. There are three types of promotions: promotion in place, promotion in line, and the diagonal jump. A promotion in place is a change in grade with little change of responsibility; a promotion in line is a change in grade with substantially changed and increased responsibility, usually to the next supervisory level; and a diagonal jump is a change in grade combined with a move to a different organization. In this article, I'll focus on the promotion in place; I'll cover the other two in articles to come. Promotion in general is no longer a reward for past performance. Rather, it's almost always about the needs of the employer. To achieve a promotion in place, your task is to present your employer with an enticing opportunity to get more value from you. Here are some tips for making your promotion in place a success. Promotions in place are relatively rare, and everyone knows that if you're promoted, you'll still be around. Attend to your relationships with everyone you work with, especially your supervisor. Make them happy you were promoted. Offer your expertise freely and publicly. Seek opportunities to present status, overviews, and reviews of your area of expertise. Read, network, and volunteer for cross-functional teams. Attend conferences, even without employer support. Keep a working journal, entering evidence of the value of your contributions, your positive attitude, and your willingness to go beyond expectations. Writing about these things creates an urge to do things you can write about. Your contributions before and after promotion will be similar, but promotion creates opportunities to make more important contributions. You might find yourself attending higher-level meetings, or you might be offered spots on more mission-critical teams. place, you'll still be around. We promote in place because we want to keep good people by keeping status, title, and compensation in alignment with value delivered. If value delivered gets ahead of status, title, or compensation, the organization begins to obstruct further contributions ("He's getting too uppity"), which can lead to conflict and frustration. There are risks. Promotions in place are usually based on contributed value which we expect to increase after the promotion. But increased contributed value usually requires increased resources, including things like training, space, and access to conferences. Before you accept a promotion in place, consider whether the available resources will support it. For more on promotions, see "How to Get a Promotion: the Inside Stuff," Point Lookout for August 16, 2006, and "How to Get a Promotion in Line," Point Lookout for September 13, 2006. Would you like to see your comments posted here? rbrenGDPxjMOCPgGWydPnner@ChacNObWzAXiuWCVPPuhoCanyon.comSend me your comments by email, or by Web form. I offer email and telephone coaching at both corporate and individual rates. Contact Rick for details at rbrenBVMRhiNXxjXXDDMLner@ChacBnUhCuNTGlmPmjhxoCanyon.com or (650) 787-6475, or toll-free in the continental US at (866) 378-5470.